I went to a steakhouse on Nanjing road (city center of Shanghai) with one of my American friends the other day. It’s a fancy restaurant which charges 488 RMB ($78) for a meal set per person. The environment was elegant and the food was tasty. It stands to reason that we expected decent service. Unfortunately, the waiter still gave us one menu to share, like 90% of the other restaurants in Shanghai that I’ve been to. It’s been bothering me for so long. Aren’t we supposed to have a menu for each? Then during the meal, my friend also reminded the waiter that he should serve the lady first. He nodded but he didn’t learn at all. Honestly, we were not that satisfied with the service and to our surprise, we were forced to add 15% service fee to the bills for that level of service. As the manager explained, the service fee is like an international convention; however, the service here is worse than what I’ve experienced in the US. I would love to tip the waiters or pay the service fee if the service is good. Here, I’m not sure if the service is 15% better when they charge 15% service fee. In the US, the servers’ salary mainly depends on the tips they get from the customers. The restaurant manager only pays servers the lowest salary by law. The service level can decide how much they can earn. That ensures that the service quality in the US is decent. When I was in California, whether I went to a small family style diner or a fancy French restaurant, waiters greeted me with smiles. They wanted to help and they knew the menus well. They are professional most of the time due to the tipping system. They constantly served me sample of wine and food that I didn’t order. I knew they did it to get more tips from me and the managers just turn a blind eye as they know it can gain more returned customers. The customers have the right to decide how much they want to tip based on the service they receive, which to me is totally fair. However, here in China, whether the servers are paid 2000 RMB ($320) or 1000 RMB ($160) is up to the owner of the restaurant. As long as they don’t break the plates or annoy the customers, their salary won’t be deducted. In other words, no matter how well they serve the customers, it won’t help them add any more pennies to their pockets either, unless the boss decides to give them a raise some day. I’m watching an American sitcom called Two Broke Girls which is about two waitresses who are making their efforts to build their cupcake business in Brooklyn, New York. When one of the waitresses Max knew the manager was to hire another waitress, she said, “don’t hire any new waitress. I can do all the work and I could really use the extra money.” The more tables they serve, the more tips they will get from the customers. In the US, there is only one manager in the restaurant and the rest are servers. I’ve noticed that the servers there serve the customers the whole process from leading them to the seats to pass the bills. However, in a restaurant in China, you can see a group of waiters chatting with each other instead of serving customers. There are also head waiters, division manager, lobby manager, etc. Of course, some people will say the tipping culture in the US motivate the service staff to give customers better service. It’s just an excuse. I believe we can figure out a way to enhance the service quality in China, especially in a metropolis like Shanghai. I admit the service in Shanghai is probably the best we can have in China, but compared with that in the US, it’s still far from satisfactory. The good thing is at least someone is trying and it’s working. The service at the famous chain of hotpot Hai Di Lao Hotpot is described as too good to be true. I went there twice and I was amazed by its service. For example, I went there in a raining day and right after I was seated, the waitress handed me a cloth for my glasses. Hai Di Lao is ranked as No.2 of 6528 restaurants in Shanghai on Trip advisor and it takes nice spots of Top 10 best services restaurants in Shanghai on Dianping.com (Chinese version of Yelp). 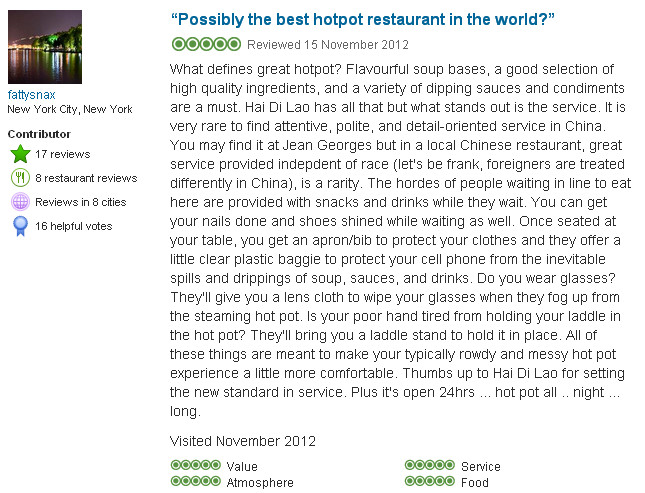 A visitor from New York even consider Hai Di Lao as the best hotpot restaurat in the world! Then, how come Hai Di Lao is able to offer such an excellent service to the customers? They don’t charge service fees at all and they don’t expect the customers to tip them either. What they do is a policy called employee stock ownership plan. All the employees, from the cleaning lady to the regional manager can all share the profits of the company. It means employees’ income is not entirely decided by the boss. Instead, it’s related to their service to the customers. The better service they offer, the more customers will come. In the end, the profits are shared by all the servers. I understand most bosses don’t want to share the profits with employees but I’m sure they can figure out a way to enhance the service quality. It should connect the service price with customers’ feedbacks. I hope next time I will be paying the service fees for the excellent service.